Inkspire Me: Holiday Catalogue Time! Happy 1st of September! I hope you all enjoyed my Global Stamping Friends colour challenge post earlier today. It's a cooler day here in Southern Ontario, and frankly it's perfect. 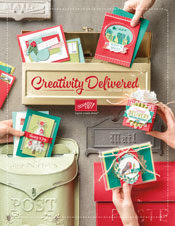 There's nothing better that a brisk breeze blowing through your window to get you in the mindset for the new Holiday Catalogue! Check out my Facebook page for my Virtual Online Catalogue party which showcases some of the new products. If you have any questions or would like to get your hands on a copy of the catalogue, just send me a note.